Forty citizens of Brno saw the building site. We are opening the gate again on March 12! On Sunday February 26 we opened the gate of the building site on the corner of Besední and Veselá street for forty citizens of Brno. After guided tour of Besední house´s foyer we introduced the visitors results of an archeological research and some curiosities about concert halls all around Europe. We are greatfull for your visit and for your support! If you would also like to see commonly closed places for public there is an opportunity on March 12 at 3 PM. It is necessety to make a reservation – konecna@salprobrno.cz. You can find more photos on our facebook here. 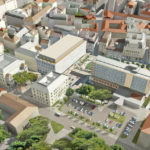 The City of Brno has concluded the qualifying round for the design team of the Janáček Cultural Centre, comprising acoustics specialist – architect – designer, which will be designing the building’s interior layout, in particular the concert hall itself. Of four candidates, two qualified for the competitive round. The first of these is the trio comprising Nagata Acoustic America, Konior Studio and Architekti Hrůša & spol., Atelier Brno. ‘A memorandum of co-operation in preparing and implementing the “Janáček Cultural Centre” project’. At one o’clock today, Minister of Culture Daniel Herman, Brno Mayor Petr Vokřál and South Moravian Governor Michal Hašek signed a document with this title. As representatives of the state, city and Region, the document commits them to co-operate with each other, and in particular to fund the construction of a new concert hall in Brno. Project funding strategy memorandum to be signed in September. Details will be discussed by the Government in October. The first meeting was held by the working team made up of seven representatives of the municipal and regional authorities and Ministry of Culture. Their main objective is to outline a funding strategy memorandum for Concert Hall for Brno project and prepare the background papers for the Czech Government meeting. 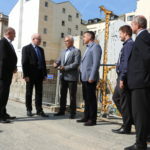 The Municipality is represented by Petr Vokřál, the Mayor of the City of Brno or Matěj Hollan, the Deputy Mayor, and Stanislav Michalík as the project manager. The team’s existence was recommended by the Ministry of Culture and it will comprise of three of its representatives, two representatives of each the City of Brno and the Government of the South Moravian Region. Magdalena Kožená, the patroness of the new concert hall, took a view of the construction site with Mayor Petr Vokřál as her guide. 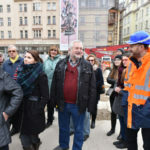 On 22nd June precious guests visited the corner of Besední and Veselá streets, the planned site of the new concert hall. The wold-famous mezzo-soprano Magdalena Kožená, who became the patroness of the project, arrived to see how the construction works continue. Brno seeks a new concert hall designer via tendering. Qualification requirements for the design documentation supplier were published. 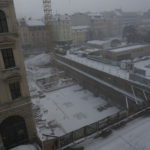 The city councillors approved the Justification of tendering for the design documentation supplier for the new concert hall, which enabled Brněnské komunikace to proclaim the open competition, starting with a qualification round for the building designer. 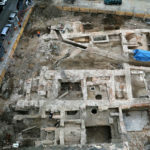 Archaeologists continue to search the lot between the streets Besední and Veselá, the future site of new Janáček Cultural Centre. According to them, the remains of some of the buildings from the 13th century are unique in their size and extent of preservation, such as the castle fortification. Builders have started their work as well, rising a sheet pile wall in order to prevent any soil slides that might occur during the construction of underground garages.